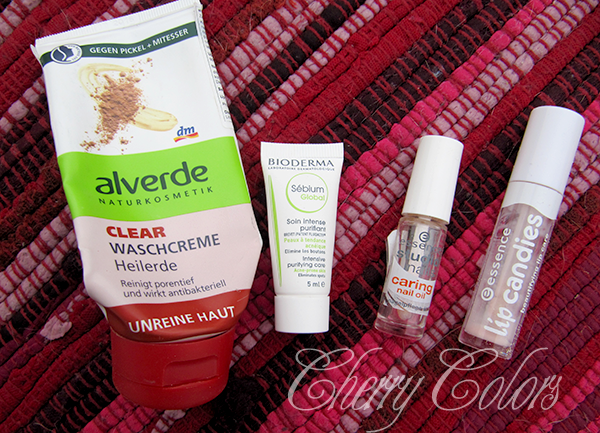 Empties #15 - Cherry Colors - Cosmetics Heaven! This one is a 15th Empties post. I am very happy that I find joy in writing these kinds of posts, and hopefully this joy will spread to different kinds of posts (make up, hello?). I managed to save quite some empty stuff, but now I just had to post it, because I don't like empties accumulating on my desk :P.
Let's start at the beginning, I took photos by categories. The first one is "Stuff I use during/after a shower". This one I actually got when I purchased a hair dye. And since I purchased three hair dyes in a span of a month, I still have two left. It is okay, tho nothing too special. Repurchase? No, but I have three more to use. I am not a fan of body milks, but I am trying to use them religiously. Especially during the colder months, when my body skin is dehydrated. It gets better during summer, but let's not be too lazy :P.
Anyway the scent of this milk is fantastic - very fresh and clean. And the effect is lovey, super smooth skin for a couple of days after use. I totally recommend it, also to get rid/help of those small annoying acne on the body (orkeratosis pilaris). I totally bought it because of the smell. And so I could use it to make bubbles in the kid's bath. He enjoyed them, but it burned when water got into his eyes o.O. So I started using it exclusively for my showers. I'm not too impressed, but it did its job well. My skin was somehow dry after showering with it. So, not worth it. I got this conditioner because I loved the other one - for blonde hair or something. That one made my hair silky and soft. This one? Nope, not a chance. It didn't make my hair any straighter or softer. Just.. nothing, lol. I also had a lot of trouble getting the balm from the bottle. It's not a squeeze bottle (I managed to crack it this way! ), and shaking does nothing. I was disappointed, because it has a lovely design. It just needs to be a squeeze bottle! I am also not a fan of the scent. 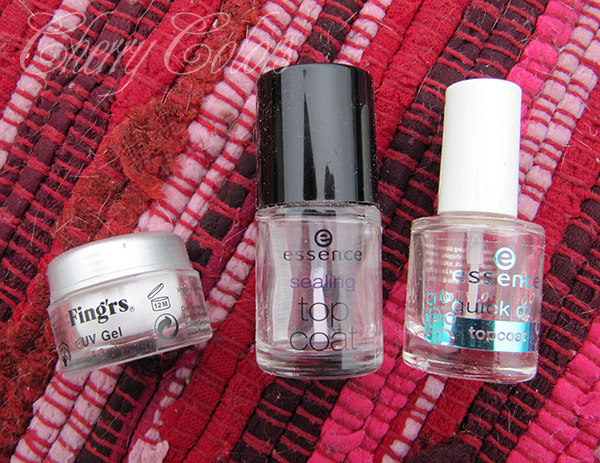 Okay, then the second picture / category "Stuff I use for my face" - with an added bonus of a cuticle oil. Whoops! I wrote about it in the previous post. And I said I will repurchase it forever, but this may change because now I'm exclusively using micelar waters to clean my face - and it makes a difference. I got this sample from my dermatologist and I was sceptical at first. But after a couple of days I saw that it doesn't break me out in any form and I'm happy. It has its smell, which isn't really unpleasant, and it feels great on my skin. I am a huge fan and can't wait to purchase the full bottle. A nail oil that I like to use very much. It smells delicious (like apricots) and add a very needed protective layer to my nails. But I can't remember if oil thins the nail or not, I must check my book. I think it does, so I'll stop a bit with the oil. 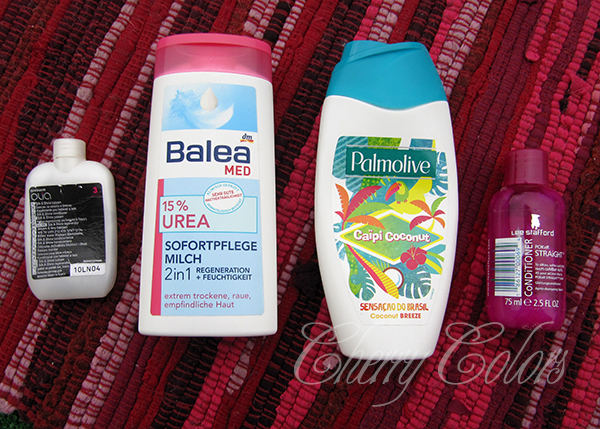 It's hilarious that most of the stuff from this post is 2€! :D But anyway I loved this product very much, so much that I took the stopper out and used the very last drop of it. Repurchase? Probably - would like to try out some different products. The next category is "nail stuff", in which I totally forgot to include the previous oil ;). I purchased this gel in the set (which contains a dehydrator, some files, cleansing pads, oil stick and a plastic pusher). 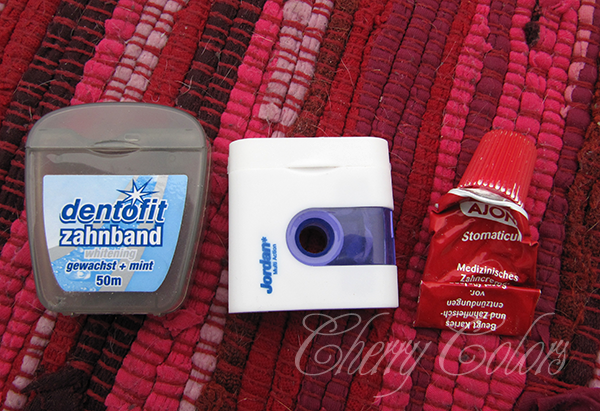 The gel alone, and in a bigger package is about 15€, if you are lucky enough to find it. It is very hard once it cures and I think it's a great one for nail extensions. I used this top coat many times, but then I kind of forgot about it. After it got to about 1/3 of it, it started thickening, so I added some thinner drops. After a while it thickened again and I decided to toss it. I still think it's a very good top coat! Repurchase? Probably, just want to try some new ones. I liked the design and the claim that it's quick drying. Well, you know what? It's not, lol. It takes quite some time to dry, but I liked the shine it gave my nails. So there's that. The next category is "teeth stuff", or "how to keep your mouth clean", haha. Meh, I am not impressed with it. It's alright I guess, does its job well. But it breaks all the time and it annoys the f out of me. It is still better than the blue version. So I may repurchase it. I can't find the best Jordan floss I had. It just doesn't exist anymore. But I found this one, that has a sweet taste (as my kid said), and did its job well. It's also thicker, so I need less flossing for a better result. Yes, it helps with my laziness. This one is a staple in my family, but now we're taking a short break from it. I am still in-love with the formula and got used to the taste. But we have too many toothpastes to use up before repurchasing. It's a great one!